Get outdoors at Dolphin & Whale Watching and Scarborough Beach. Get a sense of the local culture at Fremantle Prison and The Bell Tower. Explore Perth's surroundings by going to The Shipwreck Galleries (in Fremantle), Caversham Wildlife Park (in Whiteman) and Rockingham Beach (in Rockingham). 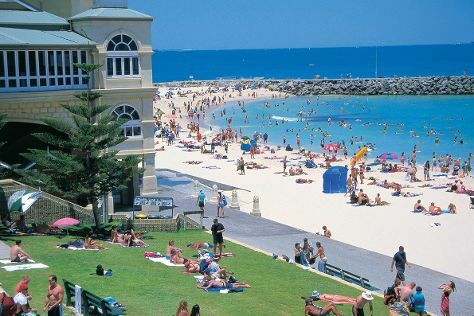 There's lots more to do: stroll through Cottesloe Beach, steep yourself in history at The Perth Mint, appreciate the history behind Kings Park War Memorial, and contemplate the waterfront views at Swan River. To see where to stay, maps, more things to do, and more tourist information, use the Perth trip planner . If you are flying in from United Kingdom, the closest major airport is Perth International Airport. In January, daily temperatures in Perth can reach 38°C, while at night they dip to 20°C. Finish your sightseeing early on the 13th (Mon) to allow enough time to travel back home.